Restricted Quantities Introduces 4Fugitives from RJS Craft Winemaking on Vimeo. The rich, brooding intensity of this blended wine is reminiscent of Joaquin Murrieta, a daring guerrilla leader turned social bandit. As an immigrant miner during the California gold rush, Chilean-born Joaquin Murrieta and his family were victims of ethnic discrimination, suffering much at the hands of American miners. Forced off his claim under the Foreign Miner’s Tax of the 1850’s, he was pushed in to a life of crime and into wearing the mask. Murrieta fought to defend lives and livelihoods of his people – stealing cattle and horses, robbery, and even murder. Revel in layer upon layer of surprise in this Chile Cabernet Merlot Syrah. Enticing hints of smoke, and luscious qualities are intricately woven into this wine’s darkly exotic character. Salut to life, to wine, and to the man behind the mask! This full-bodied dry wine presents aromas of juicy blackberries, cassis, mocha, and spices. On the palate, it showcases polished tannins and a smooth finish. 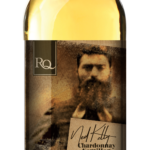 Much like Ned Kelly, Australia’s “Robin Hood” outlaw, this Chardonnay Semillon is full of intrigue and generous with its unique flavours. The son of an Irish transported convict, Ned Kelly and his family were downtrodden, and persecuted by police. Imprisoned at a young age, Ned became entangled with the “Greta mob”, and a violent confrontation at the Kelly home saw Ned indicted for attempted murder. Promising to avenge his mother’s imprisonment for her role in the incident, Kelly and his gang were labeled outlaws. But with the help of sympathizers Kelly eluded capture, demanding justice for his family and the poor in his rural community. In a last stand, Kelly and his gang wore suits of armour made from ploughs; none would survive but Kelly. Ned was captured and sentenced to death at Old Melbourne. This wine’s balanced, easy-going relationship of subtlety and freshness harmonize with the complexities of its unwitting armour-wielding fugitive. Cheers to an unsung hero! Like framed fugitive Enrico Alfano, this Nebbiolo is uncompromisingly bold in character, yet rather smooth and full of surprise. Considered a leader of a mafia-type group called the Camorra; Alfano was rumoured to have been responsible for the murders of a New York City police sergeant and a rival Camorra boss, Gennaro Cuocolo, and his wife. Many considered Alfano in the light of a demigod, as he was thought to be invulnerable to bullets and able at all times to escape his pursuers. Unfortunately, he was caught and a trial against Alfano expanded to a tribunal against the Camorra, where he was found guilty. He maintained his innocence, and after the illegitimacy of the trial was discovered, he was released after serving 27 years of a 30-year sentence. After his release in 1934, he was never seen or heard from again. A unified transparency and delicate appeal collaborates well with its robust and hearty counterparts. These are the true markers of both a leader and a great wine! Saluti to a man of lasting endurance and mystique! 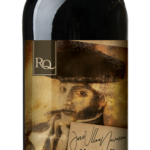 An enthralling combination of lush, spicy character creates an exceptional Spanish duo featuring this Monastrell and famed matador, singer, smuggler, and bandit, José Ulloa Navarro. It was in Salamanca where José would start his life as a bullfighter. Yet only two years later, he abandoned it for smuggling. Obtaining goods in Gibraltar, he and a partner were in charge of distribution. Called again to the bullring for the celebration of King Ferdinand VII in 1814, José’s life and love took a drastic turn. Navarro was on horseback to fight, when an accident forced him to return home unexpectedly. His unfortunate return led him to discover the infidelities of his wife. After killing the lover and the unfaithful wife, he found no other solution to his destroyed life than enlisting in the squad of bandits known as, Los Siete Niños de Ecija. All except José, were captured and executed in 1817. Like Navarro’s harrowing and wildly juicy tales, this wine will entrance and entice the palate with a voluptuous headiness and earthy appeal that will have your glasses raised! Saludos to a man who lived with such passion.